These healthy Southwestern Grilled Pork Chops couldn’t be easier to make and packs in so much flavor. Made with spices you already have in the pantry, this sweet and spicy grilled pork is a favorite. Pork has been one of my favorite things to throw on the grill lately. With a simple spice rub, these grilled pork chops can really pack in the flavor. This Southwestern-inspired rub starts with a blend of brown sugar, paprika, and chili powder if you want things spicy. From there, the garlic powder, ginger, and cinnamon round things out to make a perfect spice rub for pork, chicken, or fish. 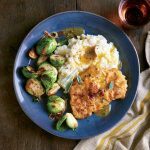 When it comes to making these pork chops, you have a few options when it comes to the cut you choose. The healthiest and leanest cuts will be boneless center cut pork chops or pork tenderloin. If you aren’t as concerned about calories and points, you can opt to use a bone-in chop like I did for the photo. It comes out delicious either way, the bone-in chop is just a little more forgiving on the grill if you cook it a touch too long by accident. It’s also what we had in the house that day. You can serve these spice rubbed grilled pork chops with simple sides such as cauliflower mashed potatoes, a lightened up mac and cheese, or corn on the cob. Or you can mix up the menu a bit by pairing the pork with a side dish that has similar flavors. Consider this Southwestern Kale Salad or simply grill some sweet potatoes with the same spice blend. If you opt to add the chili powder to give these southwestern pork chops a fiery flair, why not serve it with dishes that pack a little heat of their own? One of our favorite options for picnics is a twist on a traditional deviled egg. I like to add some finely chopped pickled jalapenos and a dash of cumin to the egg yolk mixture. Pipe the filling into your egg halves and sprinkle some cilantro on top. 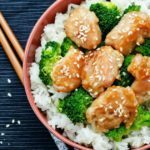 It’s a healthy side that’s packed with protein and low in points. 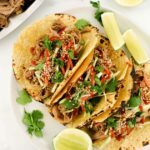 If you’re using an outdoor grill to prepare your pork, leave room on the grate for some corn on the cob and stir up a spicy spread by adding garlic, lime juice, and some fresh, finely minced jalapeno pepper to softened butter. When you’re feeling more sweet than spicy, leave out the chili powder and serve your grilled pork chops with side dishes that features some of the same flavors. For instance, make a skinny slaw or pineapple slaw. We also love grilling butternut squash. Don’t count on a load of leftovers when you serve these spice-rubbed grilled pork chops. If you want to use some as a base for a make-ahead meal later in the week, consider firing up a second batch. You can leave the chili powder out of the mix for one meal and add it to the rub for the second set of chops. These will make the perfect foundation for pork carnitas tacos or burritos. Just cube up cooked Southwestern pork chop, grab your favorite salsa and toppings, and build your own tacos or burritos. Spice-rubbed grilled pork chops also make for a satisfying sandwich. Try topping your chop with grilled onions before placing it on a toasted bun with your favorite sauce. If you want to broaden your barbeque horizons, try stirring up a batch of Carolina-style sauce. It starts with yellow mustard rather than ketchup or another tomato base. This creates a a tangy twang that pairs well with pork or chicken, just like this Southwestern spice rub. If you’re cooking for a crowd, this rub works wonders for pork, chicken, or fish, helping you keep everyone at your backyard barbeque happy. The super-versatile spice mix can also be made in advance and stored in an airtight container in your pantry. But, if you’re worried about the brown sugar clumping, you can always add it right before seasoning your proteins. How to Cook Pork on the Grill? The guidelines for cooking pork have changed significantly in the last decade, with the U.S. Department of Agriculture Food Safety Inspection Service now saying whole-muscle cuts of the meat, including chops, can be safely consumed once they have been cooked to an internal temperature of 145 degrees and rested for three minutes. That’s down from the previously recommended internal temperature of 160 degrees, so your grilled pork chops will likely be pinker than the cuts you chowed on as a kid. But, if you use a meat thermometer to ensure the chops reach 145 degrees, they’ll be tender, juicy, and grilled to perfection. When you’re at your store’s butcher counter or cold case, look for chops with a uniform thickness so they will cook evenly on the grill. Many grill masters also prefer pork chops on the thicker side because they are less likely to overcook. Again, a meat thermometer is a must, especially if you’re unaccustomed to cooking and serving pinker pork. And pork’s cooking guidelines aren’t the only things that have changed. Pork farmers have modified their livestock management practices to make pork leaner, cutting total fat by 16 percent on average from 20 years ago and slashing saturated fat by an average of 27 percent in seven of the most common cuts of pork, including chops. 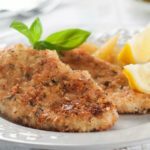 In fact, pork chops now have less total fat and saturated fat than skinless chicken thighs and pork tenderloin has about the same fat content as boneless chicken breasts, according to data from the USDA.